YOU MAY ALSO LIKE...: Why Isn't Richard Simmons Pushing This? 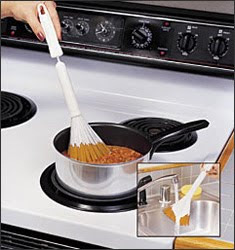 Here is a gadget aimed at people who don't have the common sense to learn how to cook properly. Like that special brand of hypocrite who thinks they're really making healthy choices by sopping up the pizza grease with a napkin before they eat it. The Fat Mop is the ultimate fat-busting kitchen gadget! Just dunk the Fat Mop into that fattening chili, soup, or stew and watch the calories disappear! Now you can double up on portions without guilt! Works great on ice cream, too! Yeah, just run that crap down the sink. Talk about a real "plumber's helper".